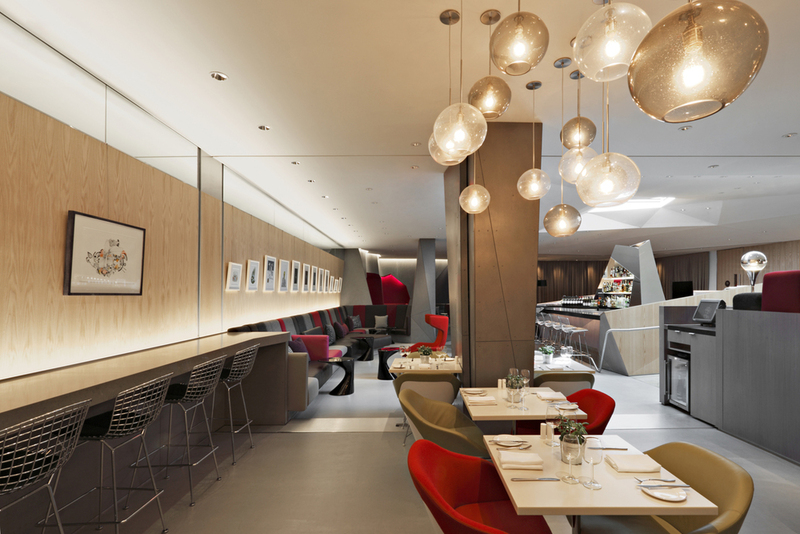 The Newark Clubhouse brings together NYC’s downtown flair and Virgin Atlantic’s warmth and individuality. A constellation of sparkling pinpoint lights draws you into the sculpted entry passage. 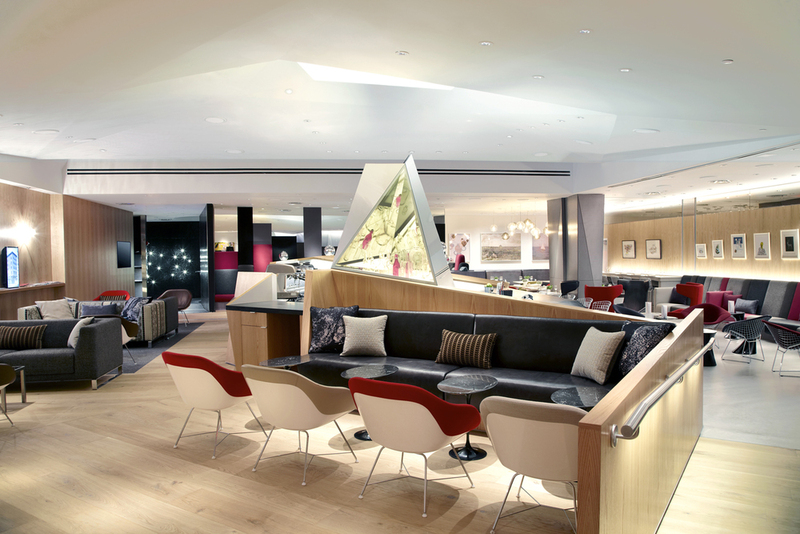 Punctuated by a sky lit receptionist at a specular desk, the entry sequence creates an extended decompression zone between the busy terminal and the relaxed luxury of the clubhouse; a dramatic immersion into the Virgin Atlantic experience. The Clubhouse is organized around a faceted bar in the center of the lounge, culminating in a crystalline bottle display under the central skylight. The geometry of this object ripples across the ceiling; an abstract geometric canopy that spills up into the two skylights. A series of distinct spaces pin wheel around the bar. 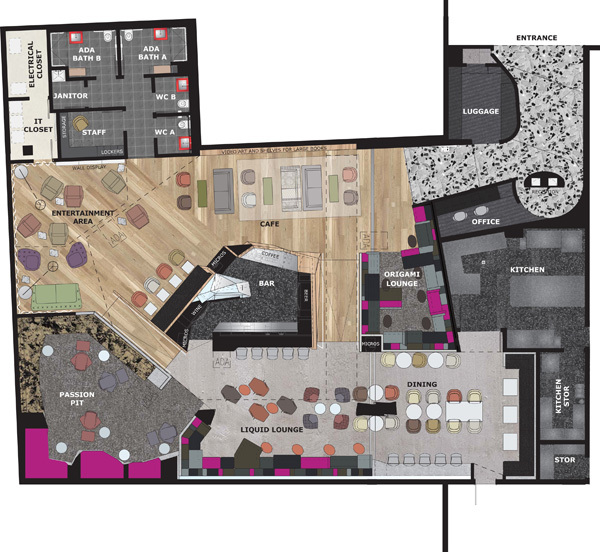 Each space references an iconic downtown typology- café, theater, art gallery, restaurant, club, bar, lounge. Grab a coffee and read a book or magazine in the wood lined café. Venture into the curtain wrapped screening room to catch the latest art house video. Curl up in an upholstered pod, carved into protective faceted concrete of the passion pit. Pull up to the bar at the liquid lounge. Sit down for a delicious meal in the gallery-like brasserie. Catch up on your email or listen to music in the colorful origami lounge. Art is central to the downtown vibe. Digital finger paintings of lower Manhattan by New York artist Jorge Colombo, animate the café. The brasserie features three mixed media works by New York artist Garrett Pruter, inspired by discarded travel photographs found in various downtown junk shops.